Cabinet Office scrapped its open standards policy before opening it to consultation last month, opening the way for a major policy U-turn. It issued a procurement policy edict on 30 November that erased a standards policy that had been in place since 31 January. It was revoked after a period of lobbying by powerful companies lined against its open standards policy that included Microsoft and the Business Software Alliance. The 30 November edict to procurement officers, Procurement Policy Note (PPN) 09/11, said it superseded the 31 January policy, PPN/311. But it contained no superseding policy. 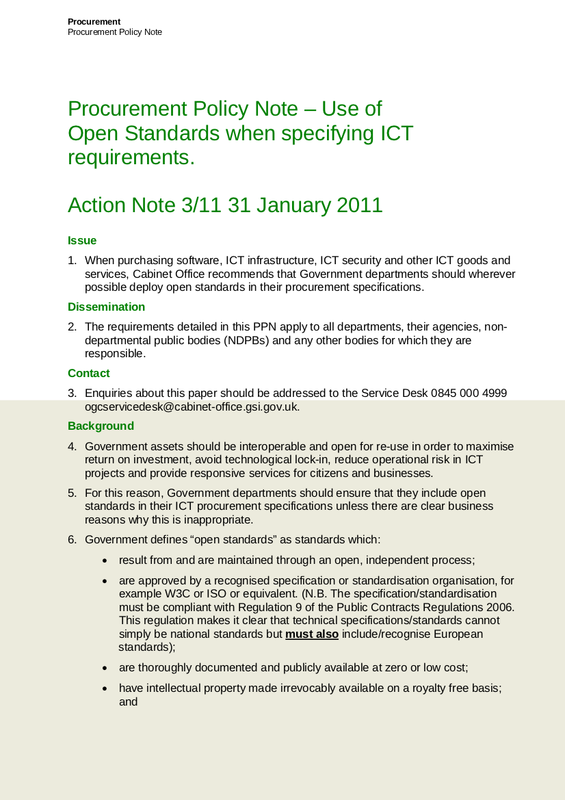 It deferred to a forthcoming public consultation on open standards the Cabinet Office had announced 5 days earlier. “PPN 3/11 has therefore been withdrawn,” it said. The policy had required public bodies to specify open standards “wherever possible” and had defined an open standard as something produced in an open forum, sanctioned by an international standards body, and made available irrevocably at zero or low cost without payment of royalties. This position was vindicated by an unofficial consultation Cabinet Office held over the summer. 87 per cent of 970 respondents said an open standard should be royalty-free. Majorities agreed with other positions the government had taken on open standards. But the Cabinet Office did not publish statistics about who the respondents were. It said it was committed to open standards but thought retaining the current policy was “inappropriate” while it conducted a consultation. A spokesman refused to say what points needed clarity or in what areas of former policy government was prepared to give ground to the proprietary software industry. Cabinet Office’s prior policy on open standards had acted as a line in the sand that invoked the spirit and principle of a long campaign for the liberalisation of public technology waged by leading Conservatives in opposition. It had been launched by Prime Minister David Cameron and Chancellor George Osborne and as the keystone of coalition ICT Strategy had been implemented by minister Francis Maude. It looked to remain stout against the anti-reformist position being pushed by IT establishment bodies with the most to lose from liberalisation. But its fumbling progress has been under sustained and biting criticism from standards experts. Gerry Gavigan, standards expert and chairman of the Open Source Consortium, said the consultation was “stupid and unnecessary”. It opened the field up to opponents of the policy and fed suspicion that it was bowing to pressure from proprietary software vendors. Graham Taylor, chief executive of campaign group Open Forum Europe, said he did not believe Cabinet Office would weaken its open standards position. OFE had pressed it to strengthen the open standard definition deployed in its original 30 January policy statement. Julian Swan, director of compliance marketing for the Business Software Alliance, said it supported the policy moves and would “work closely with the UK government” over standards policy. “Reducing public procurement expenses in the UK does not require the adoption of a policy which undermines the value of Intellectual Property and Innovation,” he said. Outgoing deputy government CIO Bill McCluggage told suppliers last month the consultation would ensure its policy was strong enough to withstand a legal challenge from “vested interests”, a veiled reference to the established proprietary software industry against which the coalition government has formed its policy position. The "formal withdrawal" of the PPN seems astonishingly clumsy. The Cabinet Office dog did bark and unnecessarily. We already knew that the definition had been reduced to the status of a draft when the standards survey was published. 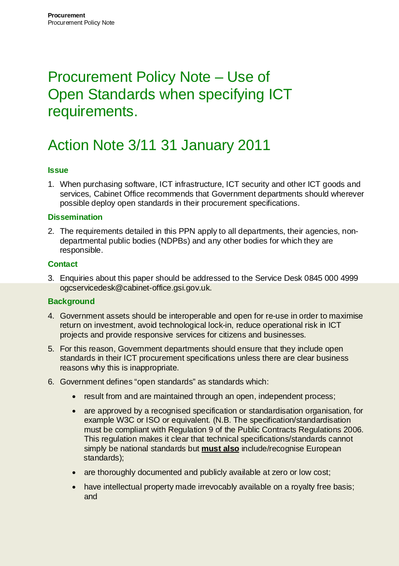 As Mark noted back in May, a Cabinet Office spokeswoman said the open standards policy was "not set in stone". There was nothing to withdraw. So as the dod did bark, we must wonder who kicked it.